I realize I do not need to interpret every recipe in the title but I just like everyone to know exactly what they may be feasting their eyes on, you know? I want to know so I assume others do as well. And if nothing else you are becoming food bilingual which is a positive in my book. If I can teach you a bit of Spanish, the world is a better place. 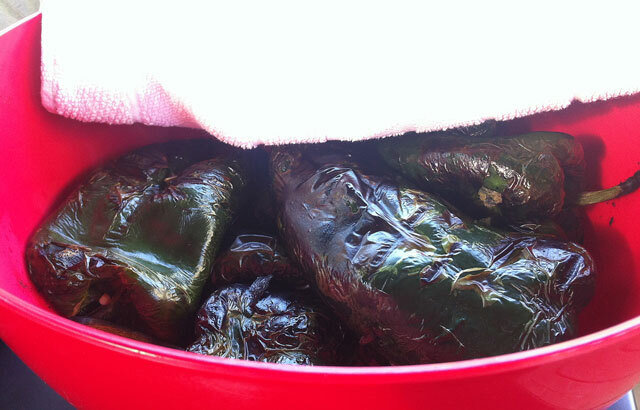 Rajas are basically a Poblano pepper taken and roasted on an open flame preferably on a grill or in an oven on broil. Then sliced medium thin. That is the basic raja. Now what happens after that can vary from region to region in Mexico from the sauce to what goes in the recipe. I grew up on mostly Northern Central cuisine so that is how I am familiar with the Rajas con Crema. And man oh man is it a bit of heaven on Earth. 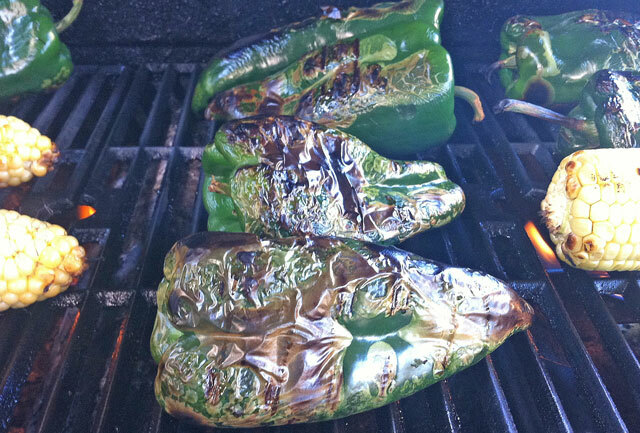 The charred Poblano bring the smokiness and the cream bring the mellow sweetness to the party and you are having a great time in your mouth. And that will make you smile, so I hope you like it and make it because you will be happy for it. This is not something you eat all of the time but it is a treat when you do. So go grill, and have a happy summery day! Note: In order to get the skin off the pepper you have to sweat the pepper after charring it. I prefer to use a bowl with a towel over the top versus the zip lock bag. It controls the sweating better in my opinion. 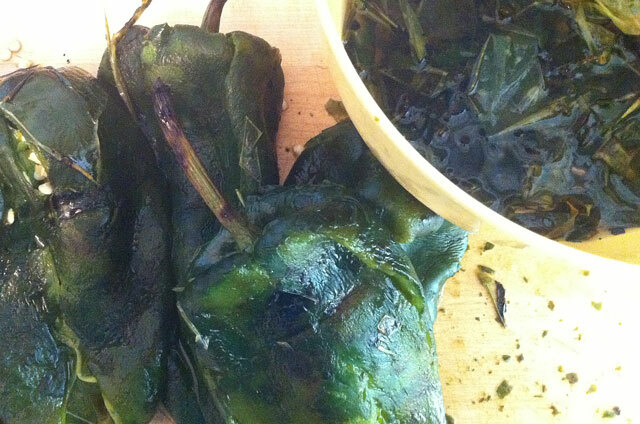 An over sweated Poblano is left mushy, and that is not super yummy. 1. Time to organize, mise en place! Julienne or slice onions, mince your garlic, set aside. Place a plastic container or cup upside down in a large bowl, this is a trick to cut your fresh corn, trust me, corn runs away when you cut it. Get a small bowl of water next to your cutting board. And a scraps bowl. Lets get grilling! 2. Take you peppers and corn out of the husk outside, fire up you grill and place peppers and corn on lightly oiled grill surface. Char fairly evenly all the way around. About 15 minutes. When each pepper is done, place in a bowl and cover it with a kitchen towel. Or place in a gallon zip lock bag. Sweat for about 5 minutes. Take the corn off and set aside, no need to sweat it. To broil: Broil on high, turning the peppers every couple of minutes, until fully charred. 3. Bring peppers and corn inside, and get peeing. Take the stem in one hand and peel the skin off the pepper with the other. When you get a skin, dip your hand in the bowl of water, it will make your peeling pepper life so much friendlier. Repeat until all of the peppers are done. Take the stem off with your hands, and de seed, use the water bowl again to rinse seeds off your hands to de seed. 4. You can slice the peppers now with a knife or just use your hands to peel slices off. 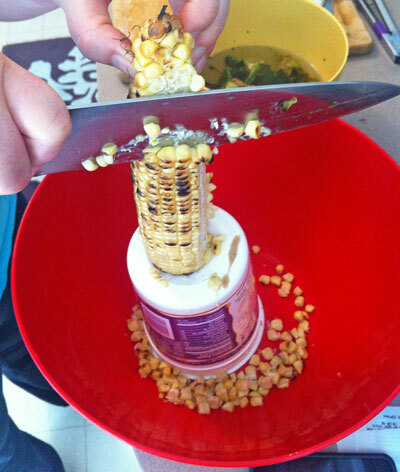 Grab your corn and place it on top of the plastic container in the bowl as seen below. Slice the kernels off of the ear, they will dance their way into the bowl, no corn mess. 5. Heat 1 Tbsp of oil into a large skillet. Place the onions in the pan over medium low heat, and cook for about 20 minutes. Color is ok, just do not burn them. The 20 minutes ensures all of the sweetness comes out of those onions. So no skimping here. Add the garlic cook for 2-3 minutes or until fragrant. Add the peppers and the corn. Mix together. Add the cream. 6. Keep an eye on the heat here. Bring to a simmer, but not a boil. Then lower the heat to get small bubbles to reduce the sauce, but not burn the bottom the pan, which is easy to do with dairy. Reduce the mixture for about 30 minutes, and it is ready to go. Serve over rice, with tortillas, or all by itself! You are welcome to grill up some chicken and mix it in too. Rajas poblanas! 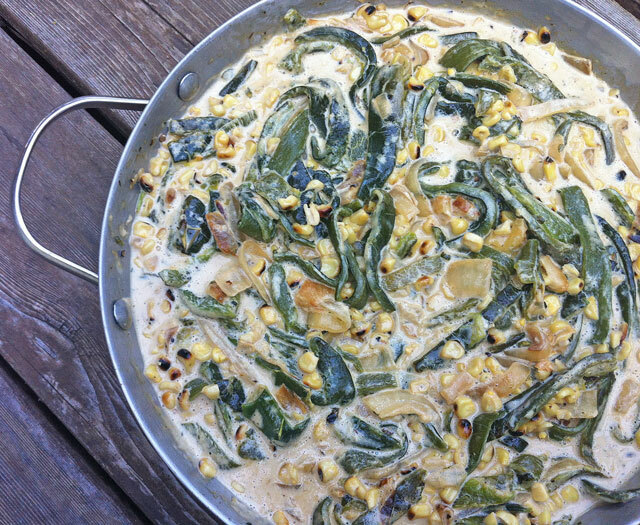 This is definitely one of my favorite ways to eat poblano peppers–smothered in cream. Yes, please! The chicken combination is great, but I like to put them in black bean and rice burritos too. They are the best, aren’t they:)? I will have to try the beans and rice combo, I hope you are doing well!